Our state of the art AcuPulse CO2 Advanced Laser is multi-functional treatment providing an effective and fast method of removing Warts, Moles, Milia, Skin tags and Xanthelasma. CO2 Advanced Laser is also used to revive damaged skin and wrinkles. It works by precisely removing outer layers of skin to reveal new skin. This controlled injury to the skin allows the skin to rebuild itself smoother and more refined. An advanced laser resurfaces treatment for removing damaged skin and wrinkles. CO2 Lasers work by precisely removing outer layers of skin to reveal new skin. This controlled injury to the skin allows the skin to rebuild itself smoother and more refined. Our state of the art CO2 laser is multifunctional and provides an effective and fast method of wart and mole removal. Our Doctors will assess the Wart/Mole and discuss with you the best way to go forward. 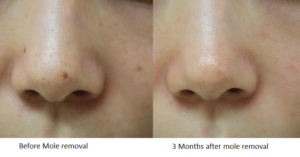 CO2 laser is also able to treat Milia, Skin tags and Xanthelasma.